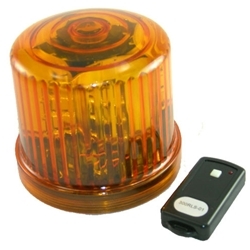 This remote control LED beacon increases visibility with 20 ultra-bright LEDs that simulate the rotating look of a police beacon. The Beacon is also equipped with strong magnets that make it easy to attach to vehicles, manufacturing equipment, shop walls, etc. Powered by 6 AA batteries (not included). It also has a standard jack for an optional 110V power adaptor (not included). The Super Beacon is rated by the manufacturer for 144 hours on a single set of batteries. In our tests, the beacon operated continuously for 4 weeks, 24/7 on one set of batteries. This versatile beacon can be used to warn others of hazardous conditions, increase vehicle visibility or bring attention to any important area or function.